Can Corinne Abraham bounce back - again - to defend her IRONMAN Cozumel title on Sunday? You could be excused for thinking that Great Britain's Corinne Abraham (www.corinneabraham.com) has been somewhat "missing in action" for the past year, at least from a racing perspective. The truth is, largely, that she has! An IRONMAN win in three consecutive seasons (two of which were Regional Championships), and on Sunday an opportunity to stretch that to four when she finally gets to start an IRONMAN race in 2016. That is impressive. When she can get to a start line, she tends to race very well. I've followed pretty closely the ups and downs of Corinne's career over the past six or seven years, regularly speaking during this time (see links below), and seeing her name on an IRONMAN start list for Cozumel this Sunday seemed like a good opportunity for a Skype catch-up. So, what's been going on and where have you been?! "Somebody on poolside the other day was asking me the same thing, you know 'where have you been, what's been going on...'. You just have the highest of the highs, and then the lowest of the lows... to have Frankfurt (2014), and then Cozumel last year off of the back of injuries. I'm just happy to be back racing. All year I've been 'I want to race, I want to race! ", and I've been on so many start lists... but I've just had to let it go." Lots of athletes at this time of year are either knackered from the season and seeking a rest, or perhaps trying to squeeze in a late season race for some Kona points - but you must be one of the few that is really ready and wanting to race? "I've been waiting all year, trying to be ready to race. You can have great races when you are not in great shape, and then with Kona (2010, 2014), when you think you are in top shape, it doesn't pan out. I don't think (now) I'm in my best shape ever, but I know that I'm strong enough to race and ready to go out and enjoy racing and see what happens." So what has keep you out of action pretty much since this race last year, has it been injury? "I've just had a niggle all year that I've not been able to shake out. I planned to do IRONMAN South Africa, but two days before I had to withdraw as I knew I wasn't ready. I came off my bike basically - nothing dramatic, nothing too hard and didn't think much of it at the time, I was just swerving to avoid a car - and a few weeks after that my leg was still hurting. I got it checked, and found that I'd fractured my femur. It's just taken a LONG time to heal. All summer I've been aqua-jogging, doing the bike stuff, not running... all the time the pain levels were low, but it just wouldn't shift, so lots of time waiting for it to turn the corner." You've been through this a few times before - long layouts with injury. Does it help that you have the experience of how to deal with it... or is there a point where you think, I don't know if I can keep coming back again? "It is hard and you do have your lows, but I think that it does help knowing that you've been through it before. I know that I've had great results off of the back of rubbish months of training in the past - but you just know that if you want to get back, you just have to persist. You have to find therapists you believe will help, keep working with your coach, persist with the aqua-jogging... you just do everything you can do to come out the other side. You just try and get through it with good grace... because nobody else can do it for you. You just have to know and believe that - eventually - it will come good." 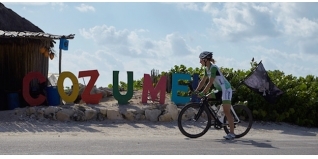 Tell us a bit about Cozumel and the IRONMAN course there? "Two years ago I met Brett (Sutton, coach), and he had his athletes out here training, so I came out here for a trial with him for a couple of weeks. It's a great place to train, it's warm, there's an amazing bike path which is the size of a main road with pure smooth tarmac. It's windy as heck... no hills, nothing that even remotely resembles a slope! So, it's the wind that you use for your hard efforts. It's a relaxed place to be, the people are friendly and it's a safe place to be, they are super careful with their driving so the riding is good. "The bike course is three laps of the island basically - cross wind / head wind / cross wind / tail wind! I'm always chasing after the swim. I'm always fighting to get a better swim and I know it's there... It's a current assisted swim so of course that helps me. You need to think about nutrition and drinking, because it is hard to drink when you are working hard into that 20km head wind section. Run is three loops, so lots of wind again. You just have to be mentally switched on for a windy day - and if it's not windy, well, it will be even hotter." In an ideal world would this be month one of a campaign that effectively ends at Kona next year? Is that still a goal? "I'm still gunning for Kona and want to go next year, so this will be a step in that direction. Points aside though, I still want to race, but it would be nice to start next year with a foothold on the rankings, rather than be right at the bottom." Related Article: Who is Corinne Abraham?! One of the new things for 2016 was that you joined the Austrian Pewg Team (http://pewagracingteam.com/en/), it must be additionally frustrating not being able to show your new kit out there on the race course during the year so far? "Yeah... it's hard for me, but when you have other people backing you too, it's frustrating! But they have been as supportive as they can be and I just keep doing everything I can to support them and their team sponsors. It would be nice to wrap up this year being able to wave the flag, that would be good!" Longer term, any plans on for example how long you see your future in triathlon? "Beyond that I don't know, we'll see how next year goes. I'm 39 now, so 40 next year - physically, I still have the top end speed and watts, but we'll decide on the future then. But, definitely next year and perhaps another year beyond that too. "I haven't trashed the gearbox and I haven't trashed the tyres... the engine still has some mileage left in it! I'm still fresh mentally, I don't feel like I've over-raced - obviously - and in some ways I've always wanted to race more, but in years when I've targeted Kona I've race big, qualified, and then maybe got injured. Sometimes I think if you race more, you fluctuate your training more (taper in / race / recover), but if you don't race maybe it is easier to over-train because you are constantly loading the body, layering week-on-week-on-week and maybe not getting the recovery you need? "I know 70.3 isn't my physiological best distance, but I've always wanted to race more of those (you don't spend a month recovering) - but also some destination races like Iceland, Sweden and Norway, there are so many options. I enjoy the racing side of things. After Miami 70.3 I did a more local race called MiamiMan, a USAT Age-Group qualification race, and it was really fun to race. To be in a race situation, where the outcome isn't hugely important and enjoy the race for what it was - enjoying triathlon, not prize money or pro points. It was fun, so more of that please!"